Market research firm TrendForce reports that the global notebook shipments for 2017 registered 164.7 million units, a year-on-year increase of 2.1%, higher than previous expectation of 0.7%. 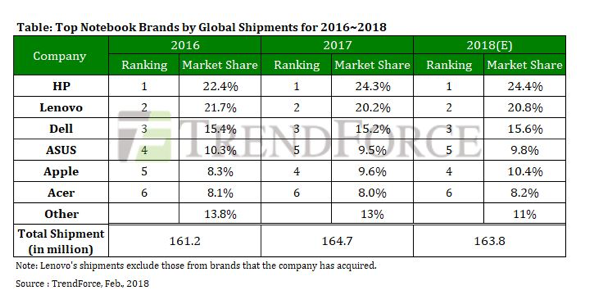 For 2018, the market share of the top six brands is expected to rise to 89.1%, squeezing the room for other brands to develop. On the other hand, Xiaomi and Huawei recorded growth in Chinese market, but the results of their overseas deployment are not clear yet. HP has demonstrated its ambition since the second quarter and recorded new highs of shipments in 2H17. Its annual shipments hit a new milestone of 40 million units, a substantial increase of 10.5% over 2016. With a market share of 24.3%, HP has retained first place in the shipment ranking. Lenovo’s laptop shipments witnessed a year-on-year drop of 4.9%. It enhanced its sales in Asia and Europe, but still cannot make up the shipment decrease in 1H17. This has an impact on the brand’s performance, making its market share down to 20.2%, ranking the second. Getting contract bids for notebooks of North America government and growth in its Chromebook shipments allowed Dell to increase its annual global shipments by 0.5%. It remained third place in the global ranking with a market share of 15.2%. The updated MacBook Pro in 2Q18 helped Apple expand shipments by 18% for the whole year, the highest growth rate among all the notebook brands. The market share of Apple reached 9.6%, 1.3 percentage points up from 2016, which allowed Apple surpass ASUS and rank fourth. ASUS has adjusted its product strategy in recent years and shrink the production of models with low profits. Hence, the brand’s shipments are influenced and its market share dropped to 9.5%, ranking the fifth. Acer continues to expand aggressively in the Chromebook market, and its notebook shipments growth in North American market raised its annual shipments by 0.6%. Its market share recorded 8%. MacDailyNews Take: Here’s to double digits in 2018! It’s still amazing that 90% of notebooks sold in the world today are pure crap. All the more amazing to me since I can’t deal with the new keyboards on the MBPs and have been holding out for improvements (or a a return to the usability levels of my 2013 MBA’s keyboard)…. That is the #1 complaint I hear about recent MacBooks. One of the reasons why I am not shopping for a replacement to my 2015 MB Pro. (oh… and the loss of Mag Safe – one of the best features of MacBooks IMO). Seriously? The solution is both obvious and available! This approach occurred to me in the first split-second after I heard that Apple was ditching MagSafe. The only question is why Apple chose not to include this solution with the power adapters that accompanied the new USB-C MBPs. I have not bothered to look for a solution that marries the old MagSafe connector to a USB-C adapter, but I suspect that is available, too. As far as the keyboard goes, I mostly use my MBP attached to a large display and an Apple mouse and keyboard. But, when I disconnect and go mobile, I have found the new keyboard to be fine. People adapted from typewriters to computer keyboards. You can adapt to one with less travel…really. Would be interesting to see their % of consumer-bought notebooks with corporate sales stripped out. It’s probably at least triple the overall number. Sheesh, do you wany a participant ribbon or what? HP and Dell are crushing Apple’s fragmented hardware designs with consistent improvements year after year. Apple can’t seem to keep up with Intel’s torrid chip release schedule. Too bad Apple is so short of cash and talent.